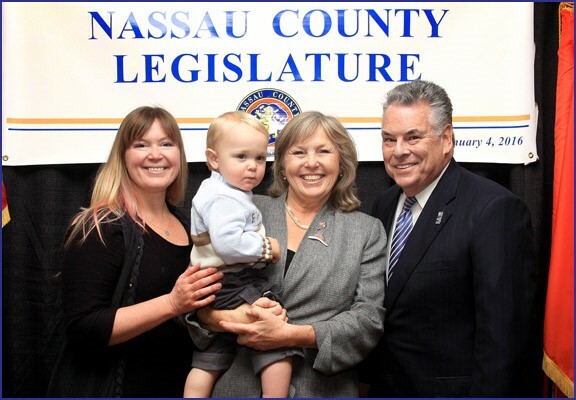 Nassau County Legislator Denise Ford was sworn in for her seventh term at the Nassau County Legislature on Monday, January 4, 2016. Legislator Ford and the other 11 Republican Legislators were sworn in by the Honorable Peter T. King, United States Congressman. At the legislative meeting on the same day, Legislator Ford was also elected to hold positions on two legislative committees. She is the Chair of the Economic and Community Development and Labor Committee and the Vice-Chair of the Government Services and Operations Committee. She is also a member of the Planning, Development and the Environment Committee and the Public Safety Committee. Legislator Ford, first elected in 2003, is proud of her record of fiscal conservatism and constituent service. Her goals for this term include improvements to public safety and the environment. The Legislature will also continue to fight for fiscal prosperity and work together with the County Executive and NIFA to make Nassau the best place to live work and raise a family.